What Does a Respiratory Nurse Do? How Do I Become a Respiratory Nurse? Where Do Respiratory Nurses Work? A respiratory nurse, also called a pulmonary care nurse, is a nursing professional that plays an instrumental role in the treatment of patients who are suffering from respiratory problems. As problems in the respiratory system can result in several complications, some of which can be fatal, proper treatment is essential. A respiratory nurse will often care for patients that suffer from both acute and chronic respiratory illnesses. Such illnesses include asthma, pneumonia, bronchitis, emphysema, tuberculosis, and lung cancer. Respiratory nurses enjoy the rewards of implementing treatment plans for patients with respiratory issues and monitoring the regimen to determine its efficacy. Therefore, nurses who enjoy forming lasting relationships with patients will do well in the role. Respiratory nurses must have a strong knowledge of the respiratory system, including the trachea, lungs, and bronchi, and be familiar with the related illnesses and mechanical devices used to treat them. A background in critical care nursing can be especially helpful. What Are the Education Requirements for Respiratory Nurses? The first step towards becoming a respiratory nurse is first becoming a registered nurse. To become a registered nurse, one must first obtain a nursing degree. An Associate's Degree in Nursing (ADN) will take two years to complete, whereas a Bachelor's of Science in Nursing (BSN) will take four years. Earning a post-graduate Master's of Science in Nursing (MSN) degree will take an additional two years. Upon completing either an Associate's or Bachelor's nursing program, one must then pass the National Council Licensure Examination for Registered Nurses (NCLEX-RN). With a master's degree, the respiratory nurse will then specialize in pulmonary or respiratory health. Some nursing schools offer more specific masters specialties such as pediatric pulmonology or geriatric respiratory health. While there is no certification specific to the respiratory nurse, many of them earn critical care certifications as offered by the American Association of Critical Care Nurses. This organization offers specific certifications for adult, pediatric, and neonatal acute/critical care, which can be very helpful to the respiratory nurse. The National Board for Respiratory Care also offers a credential in Certified Pulmonary Function Technology (CPFT), among others. A respiratory nurse works with patients who need care for acute or chronic respiratory illnesses. This population of patients can range from pediatrics to geriatrics so it is imperative that respiratory nurses feel comfortable and confident in delivering care to all age groups. In addition to planning and implementing treatment plans, another key role as a respiratory nurse is educating patients on the prevention and progression of such illnesses, including encouraging patients to modify their lifestyles and habits. What Are the Roles and Duties of a Respiratory Nurse? 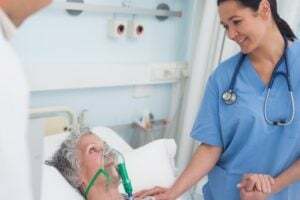 The employment outlook for respiratory nurses is on a continuous rise, and prospective nurses can expect a competitive salary and room for advancement. As years of experience as well as location play a key role in salary, on average, respiratory nurses earn $70,000 per year.